Welcome to week 5 of the Solstice Stars Series! This is our last star and I really hope everyone has enjoyed the series. Don't forget you can catch up on all the previous tutorials by clicking on the Solstice Stars Series tab at the top of the page. Later this week I plan on posting some ideas for quilt tops, just to get those creative juices flowing. Today we will be making the Two Colors Star. This star is from Barbara Brackman's book The Encyclopedia Of Pieced Quilt Patterns,page 454 and the original source of the design is Comfort, a periodical from Augusta, Maine that was published from the late 1800's to the mid 1900's. I had several thoughts when deciding how to make this star. In the end, I wanted this block to be accessible to all skill levels of quilter, so I opted for half square triangles (HSTs) and squares. I know this adds more seams, but again, I think this was the best method to reach everyone out there, including beginners. Let's get started! Step 2. Take your white/background half square triangles (HSTs) and your print HSTs and sew them together into squares. Step 3. Trim your HSTs to 2.5" squares. Tip: Use the diagonal line on your quilting ruler as a guide down your seam. This ensures an equal trim on all sides of your square. Step 5. We will now assemble the tiny squares into larger squares, creating a nine patch square. 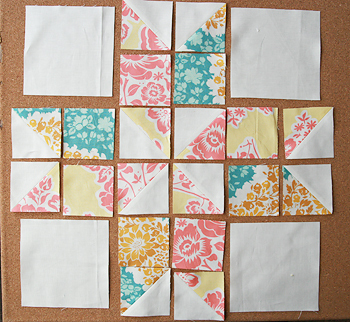 Sew the sets of four, 2.5" x 2.5" squares together. This will create 4.5" x 4.5" squares as seen below. Step 6. Sew your blocks together into rows. Step 7. Sew your rows together. You're done! Be sure to post your block photos as well as any questions in the Flickr group.